The V72G series has been discontinued. Please contact our Flow Engineering department. 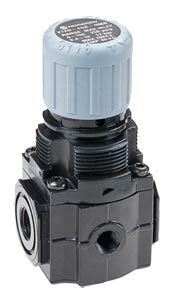 The V72G Series Air Pressure Relief Valves are designed for use as a single in-line unit or as part of Norgren's Excelon® modular compressed air preparation supply system. A pressure relief valve is uses to protect pneumatic equipment from over pressure by retarding excessive pressure build up. As a modular component, this pressure relief valve can quickly be attached to air filters, lubricators, smooth start / exhaust valves, safety lockout valves and pipe adapters. With our Quickclamp® and Quickclamp® and wall bracket accessories, a complete compressed air supply system can be assembled and mounted in minutes.